My daughter's birthday is at the first of next week. 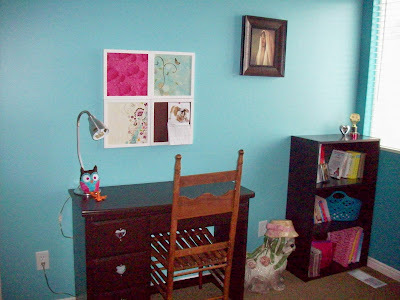 A few months ago, we decided that she would get her bedroom re-done for her birthday. It sounded like a good idea back then. Last night we shipped the three oldest over to grandma's for a sleep-over so the hubby and I could paint and decorate the room. That way we could do a grand reveal, HGTV style! We were trying to cover up stripes I painted a few years ago. One of the stripes was dark brown. Yikes. I DO NOT recommend painting stripes, EVER! Unless you're planning on living with them for the rest of your life! We had to sand the stripes, since there were ridges from where I taped them off. Then we had to do two coats of paint (and yes, we used the paint with primer, which doesn't go very far and it's PRICEY!) Sorry for all the caps, I'm tired. We got done painting around midnight, and we only quit because we ran out of paint. Got up early, ran to the store, bought more paint, finished painting and moved everything back in. The butterfly chair was a gift from her grandparents. These are a few close-ups of some of the accessories. 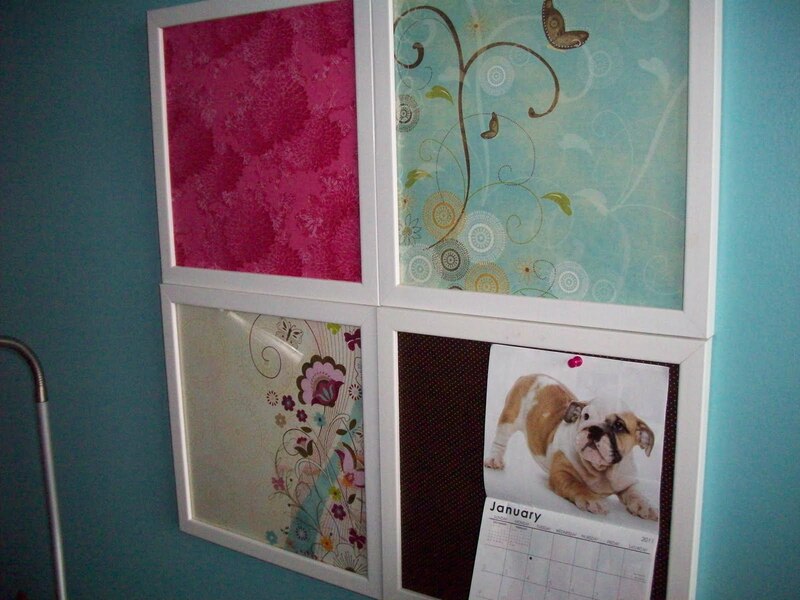 These frames we had in her nursery with bug prints in them. I put scrapbook paper in two of them to use as dry-erase boards, and fabric covered cork board in the other two for posting notes. This little owl I made using a tutorial from the DIY dish. 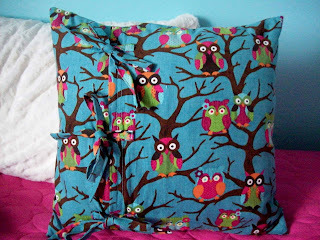 I made up the pattern myself because I wanted it to mimic the owls in the inspiration fabric for the room. 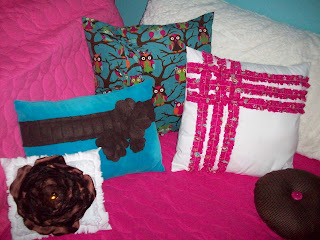 These are some of the pillows I made for her room. I am really not loving the brown circle pillow. It looks like a donut, and not a very appetizing one at that. This was the inspiration fabric for the room. She wanted turquoise, dark hot pink and dark brown. 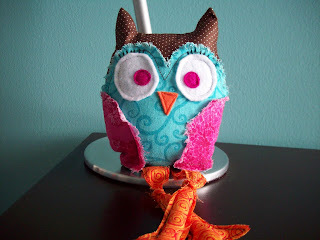 This had everything we were looking for, and darling owls to boot! 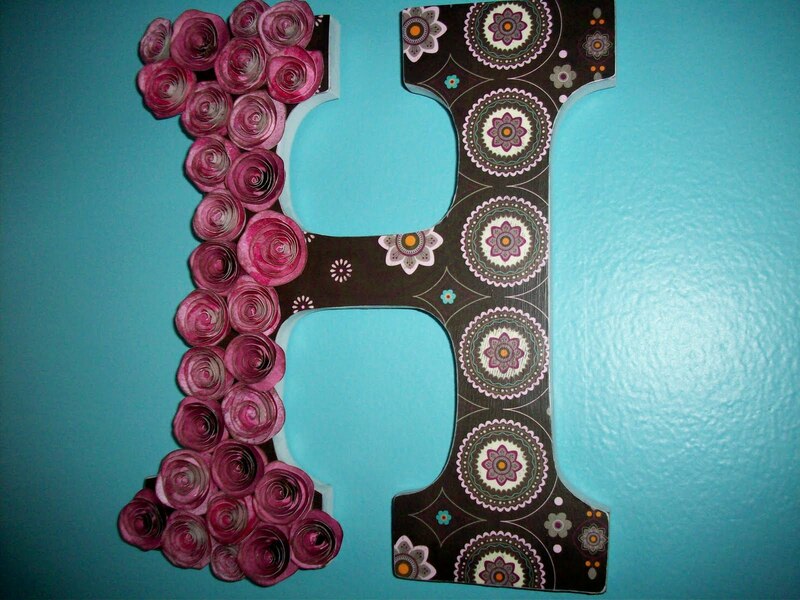 I had this monogram hanging in her room for a long time. It had colors that went with the stripes, so it was time for a re-do. I made all the paper roses and glued them to the letter after I covered it with scrapbook paper. It took forever (read 2 1/2 hours) but she loves it, and it's really cute! This is her face when she first saw the room. She keeps going back up there to check it out. She says it doesn't really look like her room anymore, but I'm sure it will only be a matter of hours before she feels like it's really hers! She's an amazing kid and really deserves every wonderful thing that comes her way. We were so glad we could do this for her, and I hope every time she goes in there, she remembers how very much we love her. Looking good...love all the colors you have here! Merry Christmas! Great job on the pillows! 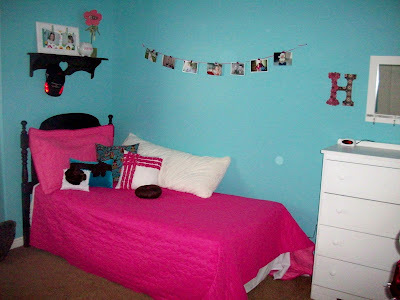 I bet your daughter loves her new room! Love that owl by the lamp. 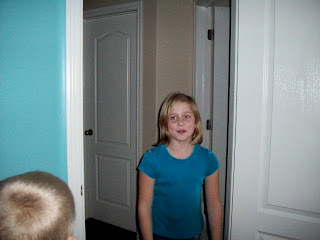 Your daughter looked HGTV thrilled. It came out great, the color scheme is fantastic! It turned out so great. I love the colors she chose. 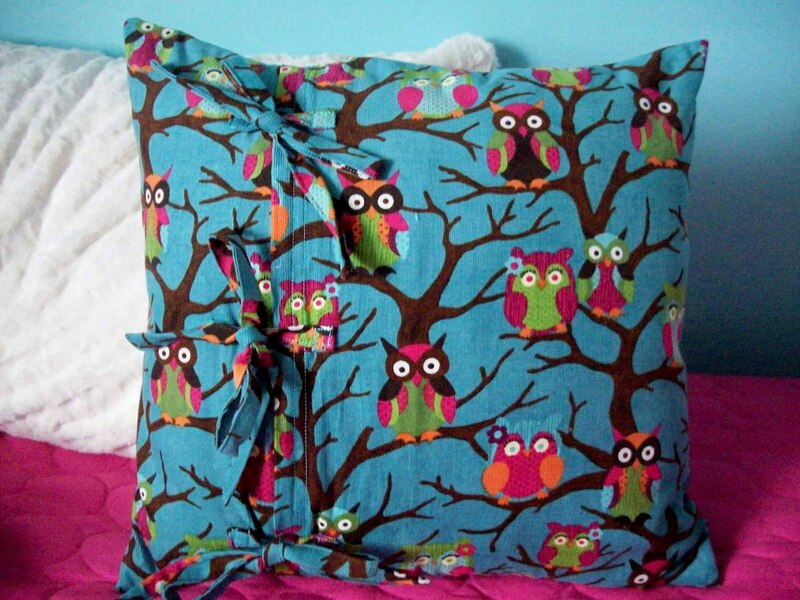 The owl and pillows are adorable. You should come help me paint. Once I start I'm fine, but I can never get motivated. You know me, I'm all for under an hour projects. Great job and an awesome birthday gift! The look on her face is priceless. What a great gift. 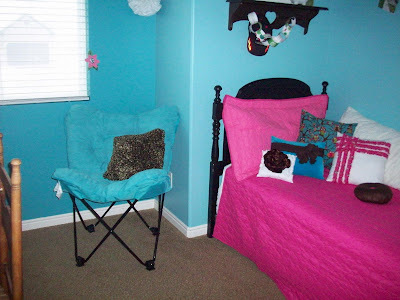 It is definitely a tween bedroom. I bet she loves it. How cute!!! The room turned out so great. I love the pink and blue together. And I love how you tied them both together with the accessories. I bet she was thrilled!! what great colors and those pillows are gorgeous. What a lovely surprise. Thanks for linking up to Topsy Turvy Tuesday's!